We’d love your help. Let us know what’s wrong with this preview of Cinnamon Girl by Juan Felipe Herrera. When the towers fall, New York City is blanketed by dust. On the Lower East Side, Yolanda, the Cinnamon Girl, makes her manda, her promise, to gather as much of it as she can. Maybe returning the dust to Ground Zero can comfort all the voices. Maybe it can help Uncle DJ open his eyes again. To ask other readers questions about Cinnamon Girl, please sign up. From the book jacket When the towers fall, New York City is blanketed by dust. On the lower East Side, Yolanda makes her manda, her promise, to gather as much of it as she can. As tragedies from her past mix in the air of an unthinkable present, Yolanda searches for hope. Maybe it’s buried somewhere in the silvery dust of Alphabet City. This slim volume is told entirely in free verse. The poems are visceral and disturbing, emotional and moving. And yet, I felt somehow removed from Yo From the book jacket When the towers fall, New York City is blanketed by dust. On the lower East Side, Yolanda makes her manda, her promise, to gather as much of it as she can. As tragedies from her past mix in the air of an unthinkable present, Yolanda searches for hope. Maybe it’s buried somewhere in the silvery dust of Alphabet City. This slim volume is told entirely in free verse. The poems are visceral and disturbing, emotional and moving. And yet, I felt somehow removed from Yolanda and her pain. I think part of that was because Herrera does not give us a linear timeline. He skips back and forth, starting in a hospital room where Yolanda and her mother await news of her uncle DJ’s condition after he’s been pulled from the wreckage of the World Trade Center collapse, then moving back and forth in time to give the reader the story of this family’s background, their struggles and triumphs, joys and heartbreaks. The changes in tone, voice and time frame kept me off balance. A couple of stylistic choices do help the reader. Different fonts are used depending on whether Yolanda is relating what is happening in “real time,” reading an old letter from her uncle, or copying an earlier poem or school assignment. Additionally, he includes a date stamp on most entries, which helps determine the time frame. Nevertheless, what does come through loud and clear is the emotion being felt. From the typical teen lament of “no one understands me” to the joy and freedom of a new friendship, to the very real fear of having lost someone in a tragic accident, Herrera’s Cinnamon Girl will resonate with many readers. I was not a fan of this book. It is written in verse, which is fine, but I think it's a little too abstract; I had a hard time following the plot. I would not recommend this book. 1CCinnamon Girl 1D is a poem that reads like a story. Of course, the author Juan Felipe Herrera must have been compelled to provide an interesting narrative 13 the poem is 152 pages long! Guau! This story about a young Puerto Rican girl from the Bronx sucked me right in. The twin towers have just been brought down, and Herrera 19s main character Yolanda is dealing with the tragedy in her own way. Her uncle is dying, and her crack head friends are headed in the same direction. The poem reflects 1CCinnamon Girl 1D is a poem that reads like a story. Of course, the author Juan Felipe Herrera must have been compelled to provide an interesting narrative 13 the poem is 152 pages long! Guau! This story about a young Puerto Rican girl from the Bronx sucked me right in. The twin towers have just been brought down, and Herrera 19s main character Yolanda is dealing with the tragedy in her own way. Her uncle is dying, and her crack head friends are headed in the same direction. The poem reflects how a young girl from Iowa makes sense of the insanity and chaos that is New York City. Like the author, Yolanda has a poetic heart. She collects dust in bags to remember the death and destruction. She keeps letters stuffed inside a cereal box to remember love and affection. 1CCinnamon Girl 19s rhythm and weird imagery drew me deep inside the poem. Cinnamon Girl 19s sense of hope kept me reading to the end. But here is something I 19d like to add today. Juan Herrera was one of my professors at UC Riverside. And somewhere in the semester he described his experience of writing this extended poem. He put his heart and soul into the creation of something that would make sense of a surreal moment in time. When he was finished writing, he had over 200 pages that he didn 19t know what to do with. His agent didn 19t know either. They were both emotionally involved with the subject, but at the same time they knew that it would never sell in the present form. I 19ll never forget the look on Juan 19s face when he told us this story about the amputation of his poem. He just kind of shrugged his shoulders to let us know that was the business we work in. I was very confused when I started this book. I had to reread a few of the poems because I didn't quite understand his style. Once I got the hang of it, though, it was an excellent book. It is one that made me shed a tear. It brings together narrative poems that keep the story moving, letters from Yolanda's past that describe how she got to where she currently is, and Yolanda's poetry to make this story unique, interesting, and something that pulls the heartstrings just enough. This novel is written in free verse. It is about a girl named Yolanda who's uncle was injured when the towers fell on Sept. 11. Yolanda spends her time gathering up the dust from the towers to quiet the voices. She is very close to her uncle. There are letters in a cereal box that she wrote back and forth to her uncle and they are being read every so often. A definite Latino theme in this book is extended family. This book has upper level content and would be suitable for junior high to high sch This novel is written in free verse. It is about a girl named Yolanda who's uncle was injured when the towers fell on Sept. 11. Yolanda spends her time gathering up the dust from the towers to quiet the voices. She is very close to her uncle. There are letters in a cereal box that she wrote back and forth to her uncle and they are being read every so often. A definite Latino theme in this book is extended family. To begin, I do not appreciate poetry in the way it should be appreciated. This was no different. I found myself stumbling to determine what the author was trying to communicate. I think she visited a tarot card reader, and I think she smoked some kind of drug. But then, in the final twenty pages, the story came alive and I was glad I had stuck with it. I was hoping to use this book as another example for students to check out to learn more about how teenagers reacted to 9/11, but I had a hard time following the storyline, and I'm not sure how much the free verse format would appeal to students if it's already kind of unclear what's going on in the narration. Cinnamon Girl is a free poetry book that tells the story of a girl. Yolanda who has been affected by the September 11 attacks. The book is filled with descriptive and expressive language. However, the book was confusing and I had to reread several times to comprehend. The book jumps frequently between past and present. The book is unclear and inferences have to be made from cover to cover. Serendipitous that I was reading a book on the topic of 9/11 around the anniversary of those events. 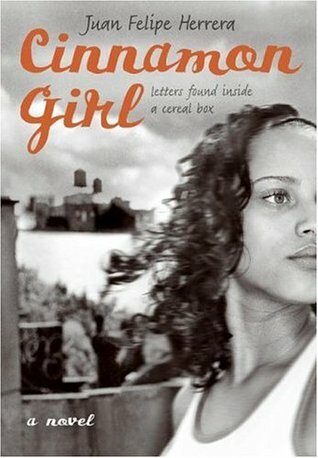 Cinnamon Girl is the story on a young Puerto Rican girl and her famiy centering on her uncle that is injured on that fateful day. The story is told through the letters of Yolanda and her Uncle DJ and Yolanda's poetry. It is an interesting twist on the events that unfolded that day in 2001. A story that takes place during the 9/11 attacks. A bit confusing because it switches to before the attacks and after. Quite different than Margarita Engle's perspective writing. It was alright...My copy was an ARC though. It was fine, but didn't really care for it one way or another. Great quick read. Different style than I usually read, well written. My mother taught me if you don't have anything nice to say, don't say anything at all. Novel in verse. A girl deals with the death of her uncle post-9/11. Kept jumping around between the past and future and present and who was talking. I couldn't finish it. Related to 9/11. The first fiction I've read relating to that. A bit hard to follow. Not my favorite collection. Not sure if it's cause it's YA, but I just couldn't get into it. Its by the current poet laureate of the US, a Latino poet. The narrative poetry follows a young woman in the Midwest struggling to deal with growing up in a Puerto Rican family as her uncle faces a health crisis. Wasn't for me, but might be for you!